HIT! 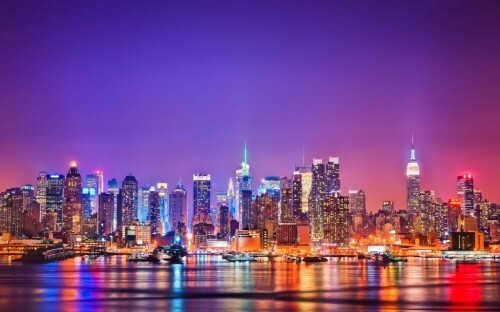 Cheap flights to New York for only €254! UPDATE: 6.10.: Cheap flights between Oslo and New York again available for just €255. Example dates: 7.-20.11., 16.-28.11., 4.-11.12., 23.-31.1., 1.-13.2. 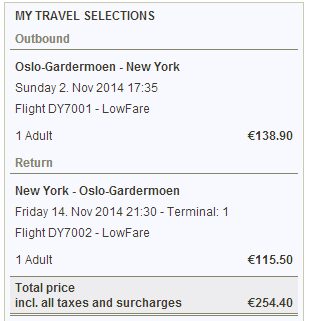 UPDATE 9.9.: New cheap dates from Oslo to New York between December 2014 and March 2015 for €254! E.g. 9.-23.12., 9.-18.1., 6.-15.2., 1.-15.3. Norwegian now offers really cheap tickets to New York for Winter 2013/2014 including Christmas! Return flights from Oslo to New York are available for only €254. This fare includes only 10 kg cabin luggage so if you want to take a big checked-in luggage with you you have to pay extra. Travel dates are from November onwards, from January you will pay €40 more. Oslo is easily reachable from any major European city by number of low cost flights (Norwegian, Ryanair, WizzAir, …). « Cheap flights to Morocco: Marrakech and Fez from Milan for €45!